Whitson has now spent the most cumulative time in space of any American. Peggy Whitson is a NASA astronaut who just won't quit. As of early Monday morning, Whitson has spent more cumulative time in space than any other U.S. astronaut. Astronaut Jeff Williams previously held the record with 534 days, 2 hours and 48 minutes. Whitson began her third long-term stay on board the International Space Station back in November. Since then, she's become the first woman to command the ISS twice and has completed the most spacewalks of any female astronaut. 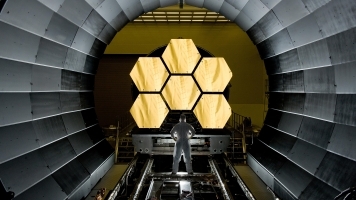 Related Story How Does NASA Transport A Massive $9 Billion Telescope? Whitson's hold on this latest record won't be an easy one to break. Her stay on the ISS was recently extended to September, which means when she finally touches down on Earth, she'll have spent 666 cumulative days in space. That still won't be enough to beat the world record-holder, though. In 2015, a Russian cosmonaut set the record with an outstanding 879 days. That's almost two and a half years.